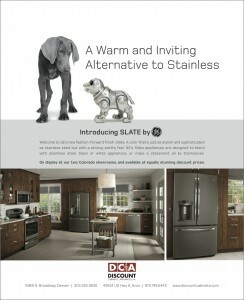 To introduce the Slate line, the ad uses the headline, “A Warm and Inviting Alternative to Stainless” and features two pets — a Weimaraner and a robotic dog. Slate appliances are designed to blend with stainless steel, black or white appliances, or make a statement all by themselves. The ad will run in Modern in Denver magazine.